Daylilies are one of the best discoveries for a novice perennial gardener. These persistent plants are reliable bloomers and prolific propagators. A few clumps become dozens within a decade, making the daylily the choice of members of a mobile society who want a garden or landscape that reminds them fondly of small towns. Whether you’re gifted with some divisions or buy expensive hybrids, these one-a-day blooms will flourish nearly anywhere and fill your garden with graceful old-fashioned beauty. Hemerocallis (literally "day of beauty" in Greek) is a monocot angiosperm. It spreads by rhizomes, like hostas, and sends long "scapes" of as many as 30 blooms from a grassy base. The original species open one bloom a day until all of the buds have bloomed. 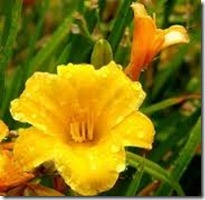 The daylily is not actually a true lily (which grows from bulbs) but gets its name from its bloom’s similarity. Lily flowers bloom in sequence for a few days, often creating clusters of three to seven blooms. Although their blooms last only a day, each daylily scape carries a dozen or more blooms, outlasting their more refined cousins. 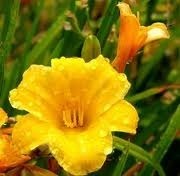 Daylilies appear to have originated in the Asia where they were used as food and as an ingredient in herbal medicines. They were perhaps brought from China by Marco Polo, then to the New World where they grew wild and in cottage gardens until the 1920s when Dr. A.B. Stout began studying the half dozen native species. Today there are tens of thousands of daylily hybrids gracing gardens and fields in every corner of the hemisphere. From less than two dozen original species of daylily, hobbyist hybridizers have crossed them to form thousands of cultivars with double, ruffled, star-shaped and spider blooms. No one has yet grown a daylily without grass-like foliage but leaves do vary in thickness and deepness of color. The only flower colors daylily growers have not yet achieved are blue and black. Daylily scapes rise from 1 to 4 feet above foliage that may arch from 6 inches to 3 feet above the ground. Flowers vary from about two inches across ("pony" size) to as much as 6-inch "giants." All daylilies set seeds in pods after bloom but most casual gardeners rely on the daylily’s aggressive runner system, a habit that has the common daylily (fulva or "tawny") close to making several states’ "noxious weed" lists. Daylilies grow throughout North America, Europe and Asia. They require well-drained soil but will grow in sandy, gravelly or loamy soil. Depending on variety, they thrive on sunny hillsides, along shady streams or woodlands. The wise gardener will plant varieties that have been developed in the same hardiness zone and a similar climate to save him the work of accommodating imported varieties. The thoughtful gardener will help control the spread of tawny (fulva) daylilies in areas where they’ve become invasive by limiting planting to hybrids. Daylilies are a natural choice for perennial borders and gardens. They demand little in the way of care, suffer little from few garden insects, reproduce freely and reward a little water and fertilizer with a burst of bloom each day over a period that (if plants are chosen carefully) can last all summer long. From the bloom of the first sunny Stella D’Oro in May to the last baroque ruffle of fulva Kwanso in September, daylilies count the days of summer.